Frank Family Vineyards is one of the most sought after tasting rooms in the Napa Valley. It has been voted best tasting room in the Napa Valley for 8 years in a row in the bay area's A-List competition. Also selected as "Winery of the Year" in 2012 by the Connoiseurs' Guide to California Wine. Winemaker Todd Graff sources from approximately 380 acres of estate vineyards for Frank Family's portfolio. Frank Family Vineyards expanded and enhanced their much beloved tasting facilities in 2008, opening a new tasting room in the original Craftsman house on the Calistoga property. The tasting room provides separate tasting areas for sparkling wines and still wines, with four additional rooms available for private tastings. Tastings are $40. Always jovial and often brimming with laughter, guests that visit the tasting room often find the experience refreshing in that the only focus at Frank Family Vineyards is wine and fun. The tasting room is consistently recognized by top national publications, wine tasters and aficionados across the board as one of the best in the country. 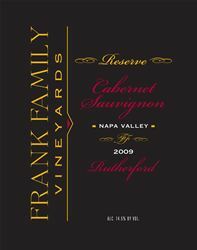 To join the wine club, visit www.frankfamilyvineyards.com or call 707-942-0859. Napa Neighbors recieve complimentary tastings as well as discounts on eligable wines, Monday-Thursdays only. Frank Family Vineyards is certified under the Napa Green Winery Program by the Napa County Department of Environmental Management (DEM) and the Association of Bay Area Government’s (ABAG) Green Business Program and completed all the regulatory components needed for environmental sustainability. These components included developing water and energy conservation methods, preventing pollution, and reducing solid waste. In addition to developing sustainable winery practices, this program is set to become the standard for the state of California. Frank Family Vineyards is certified under the Napa Green Certified Land Program. Frank Family Vineyards has created and implemented a customized farm plan with measured results that addressed all aspects of its property, vineyard land as well as non-farmed land, including practicing soil conservation, water conservation, stable drainage, riparian corridor enhancement, fisheries and wildlife habitat enhancement and long-term improvement and sustainability.